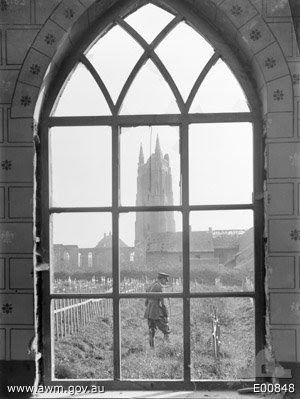 Poperinghe was the primary military centre for British forces located in Flanders, just under 10km west of Ypres (itself formerly a bitter trade rival). Its population in 1904 was placed at 11,680. 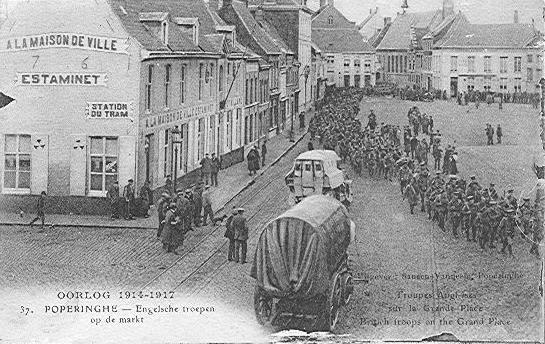 Poperinghe in 1917, with Scottish troops in the Grande Place and the re-named Grote Markt today with the Stadhuis, or town hall, in the background. 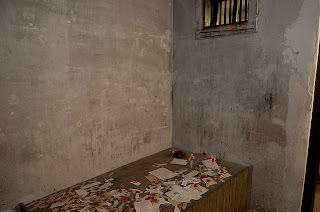 The cells inside where soldiers waited for their execution "to be shot at dawn"
The last words of the condemned etched onto the walls before the sunrise. 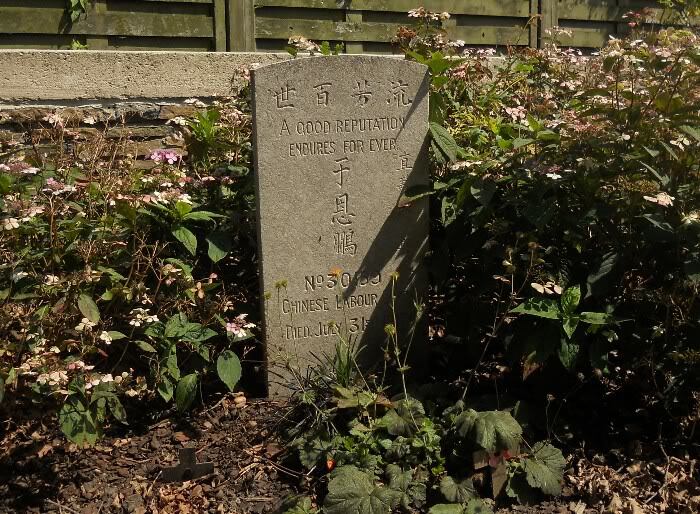 The execution post on display in the inner courtyard of the Poperinghe Town Hall is said to be that used on 8th May 1919 for Wang Ch'un Ch'ih of the 107th Chinese Labour Corps. 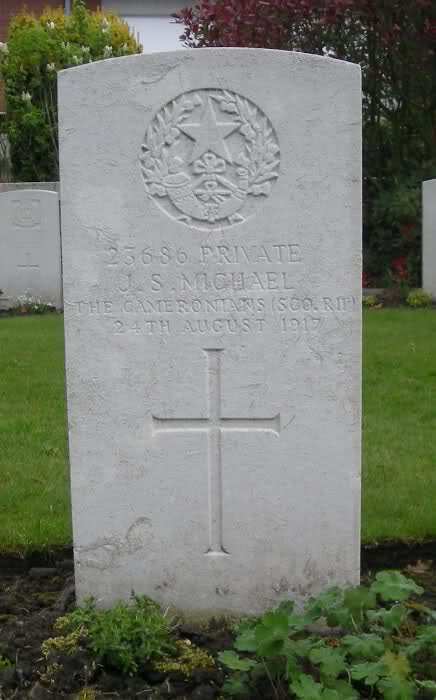 He is buried at Poperinghe Old Military Cemetery. Sixteen others executed in Poperinge were buried at Poperinghe New Military Cemetery. 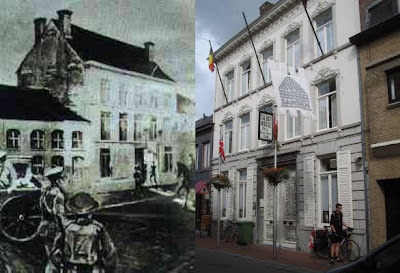 Talbot House in Poperinge is one of the most evocative sites from the Great War era. 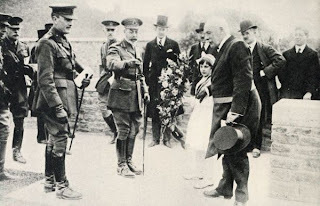 It was here that two army chaplains, Philip ‘Tubby’ Clayton and Neville Talbot, opened a club for soldiers. 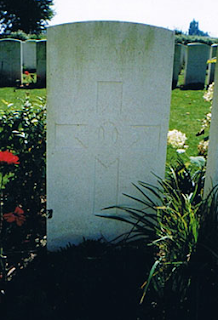 Named in honour of Gilbert Talbot, who was killed at Hooge in 1915, it became known as Toc H after the army signal code used in the war. More than half a million soldiers visited the club, which was housed in the mansion of a local hop trader, who had fled the country. It was a place where everyone was welcome; where military rank did not count; and where the troops could play the piano or borrow books (simply by leaving their cap as a deposit!). 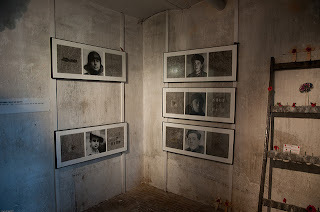 In short, it was a place where soldiers could become human again. The authentic interior has been largely preserved and the unique spirit of the place can perhaps best be experienced in the chapel - simply called the ‘upper room’ - which has remained untouched since 1918. The Reverend Philip Thomas Byard Clayton CH (known as "Tubby Clayton") was an Anglican clergyman and the founder of Toc H, this being signal terminology for "T H" or "Talbot House". It closed temporarily in 1918 when the German front had drawn too close. For soldiers who had to live for days at a time in a world of mud and shot-up trees, the garden was an oasis of rest and peace. 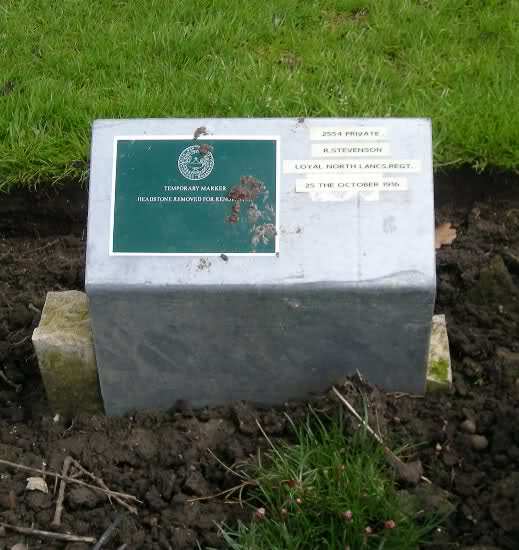 The lay-out of the garden has been restored as it was during the Great War. 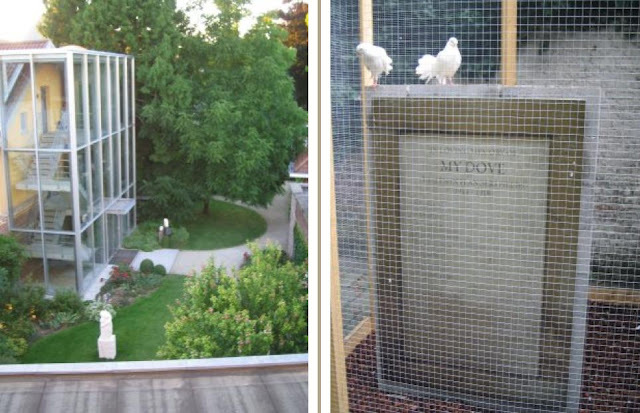 It has been recently listed as a monument by the Belgian Monument and Landscapes service. The adjoining hop store (better known during the war as the Concert Hall) and the former bathhouse (referred to as the ‘Slessorium’, after its creator, Major Peter Slessor) were both restored in 2004. After the peaceful and quiet atmosphere of Talbot House, visitors can go to the first floor of the former hop store, the actual Concert Hall. It was this room that became the stage for many recreational activities in 1917. Visitors are shown a film of a concert given by the performers 'The Happy Hoppers'. Sentimental and happy songs, jokes and dances are brought together in a non-stop show and this gives a good idea of how things were in 1917. 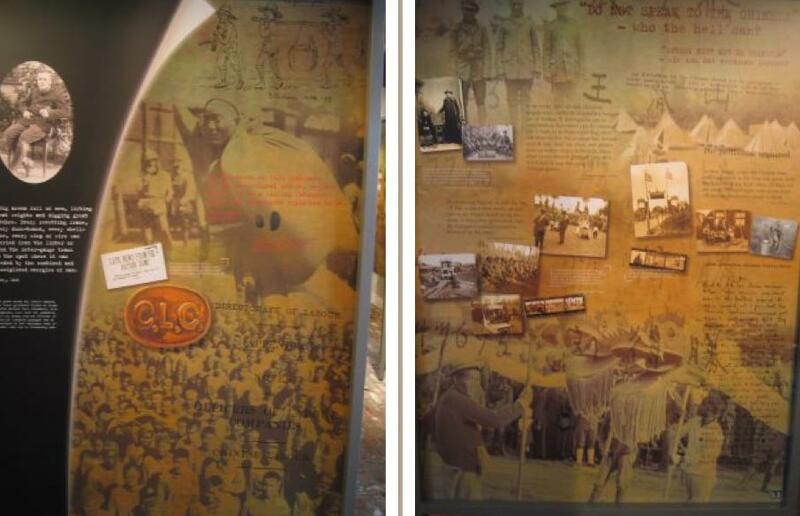 A life-sized ‘album’ about ‘Life Behind the Front’ and a filmed re-enactment of a ‘Concert Party’ are now on permanent display allowing visitors to experience the true atmosphere of Talbot House during the war years and shows how soldiers spent their time away from the trenches. According to Keegan in The First World War, "the infamous Skindles for officers who wanted a good meal and the company of loose women...is scarcely identifiable" (199-200) but it looked hardly changed when I saw it in 2008.
whenever a leave train was due to depart, the enemy artillery interfered, but this did not prevent the place being the most popular and the most-loathed spot in the vicinity; always thronged with travellers waiting for the trains. Returning men, however, did not loiter with the same indifference. 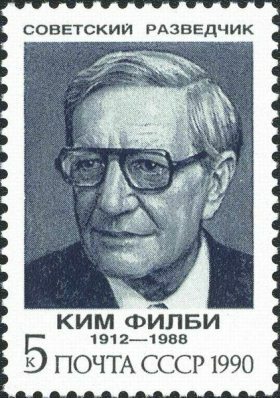 A rumour which took a great deal of scotching was that the stationmaster of Pop had been shot as a spy due to the suspicious regularity of the shelling. The grave of Lieutenant-Colonel George Baker, 38, OC 5th Canadian Mounted Rifles (Quebec Regiment), who was a member of the Canadian House of Commons. 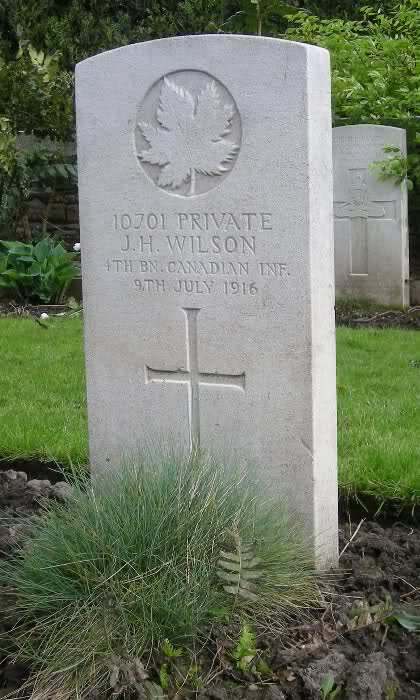 He is the only Parliamentarian to have ever lost his life while fighting for Canada. He had been the son of the Honourable George Barnard Baker KC (member of Canadian Senate). Particularly regretted is the death of our O.C. Lt. Colonel G.H. Baker who has been O.C. 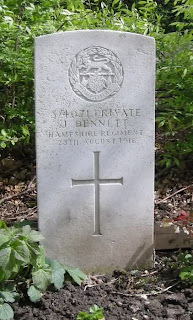 since the Regiment was recruited in January 1915. He had endeared himself to Officers and men alike by his tact and cheerfulness under all conditions. 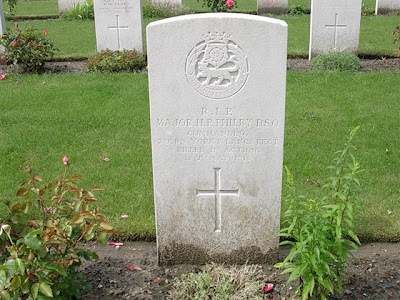 Our comfort is that he died as he wished, at the head of his men, and his cross in the new MILITARY CEMETERY at POPERINGHE (LOT 2, G1) is inscribed “Killed in action”, the epitaph of a man. 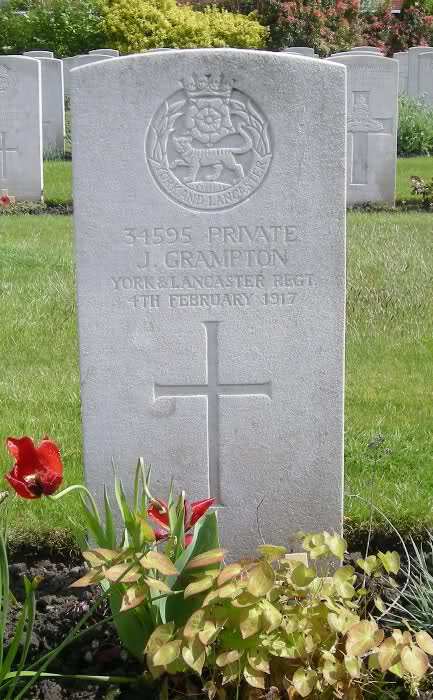 He was buried with full military honours today, the Chaplain of the 3rd Canadian Division Hon. Major A.W. Woods officiating. 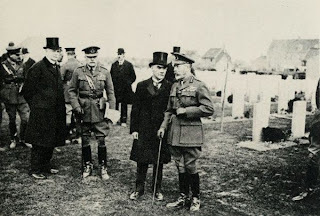 The following acted as pall bearers, Major Draper, D.C., Captain Rhoades, W., Captain French, J. (1st CMR), Captain Patterson, J. 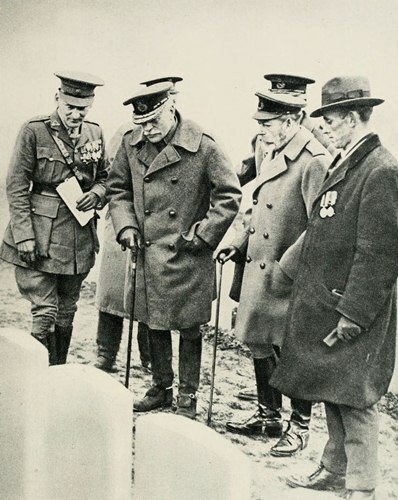 (4th CMR), Captain Robinson, E., Captain Tribeh, A., Captain Hewson, C., and Lieutenant Todd, J.S. Representatives of each platoon in the Battalion followed. This Chinese grave is sited alone away from the rest. 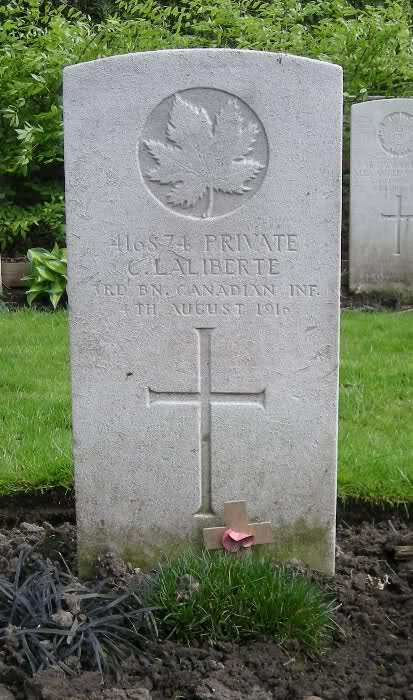 Both men had served in the Central Ontario Regiment when they deserted before the counter-attack on German forces on Mont Sorrel. 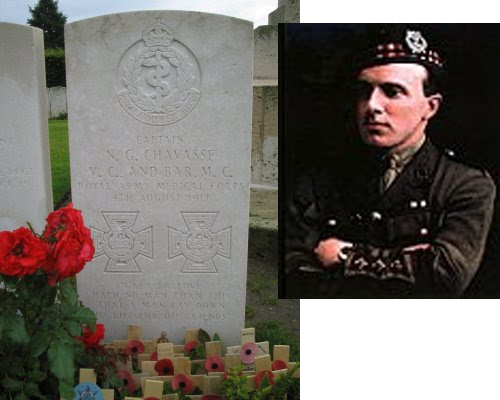 Private Crampton on the right apparently held out in Armentières for three months before being caught and subsequently executed in 1917. 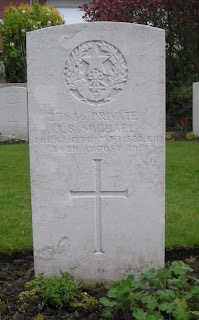 Private Michael had deserted at the start of the 3rd Battle of Ypres in July 1917. Private Tite was involved on June 30 1916 in the so-called 'Battle of the Boar’s Head' as a diversionary assault from the opening Somme campaign the next morning that was so disastrous (Over a period of less than five hours the three Southdowns Battalions of The Royal Sussex lost 17 officers and 349 men killed, including 12 sets of brothers, three from one family; a further 1000 men were wounded or taken prisoner in what the regimental history describes as The Day Sussex Died) that it doesn’t feature in the Official History. 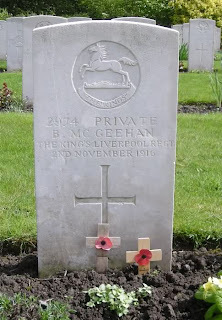 Private Bernard McGeehan on the right served with the 1/8 King's Liverpool Regiment, and was executed at 6.16 a.m. on the 2nd of November 1916 for desertion. He had been ordered along with the other men in his battalion to return to their trenches on the Somme on the 20th of September 1916, but went missing until the 25th of September when he turned up at Montreuil, claiming he had got lost. 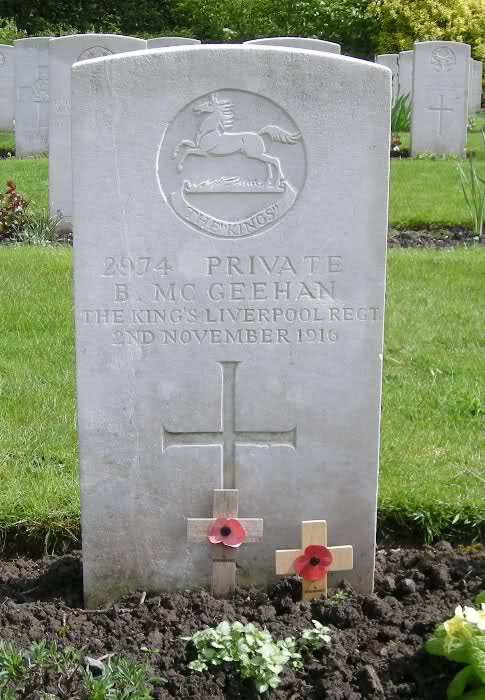 By the 28th of September the 1/8 King's Liverpools were at Brandhoek between Poperinghe and Ypres, and McGeehan was escorted to rejoin them there. He was court-martialled and sentenced to death, overlooking the fact that Bernard had walked an hundred miles attempting to find his regiment and voluntarily reported to a British army unit. He served as the focus of the play 'The Worthless Soldier' by the late playwright Sam Starrett. 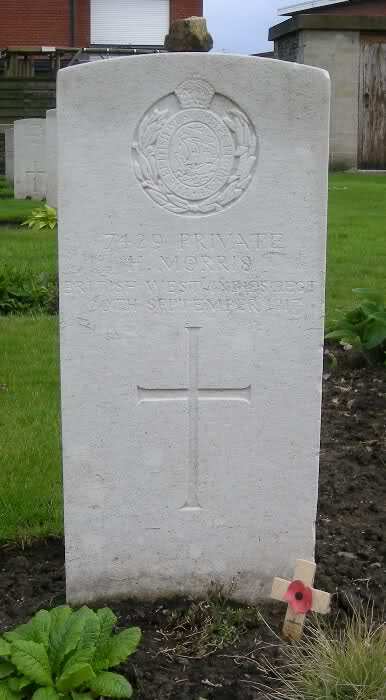 A particularly interesting grave is that of Private Morris from the British West Indies. 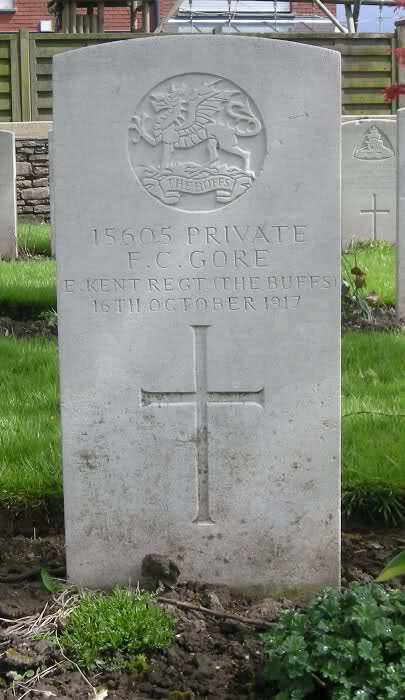 As his unit was coloured it was not supposed to be an active unit, yet he was still executed for desertion. 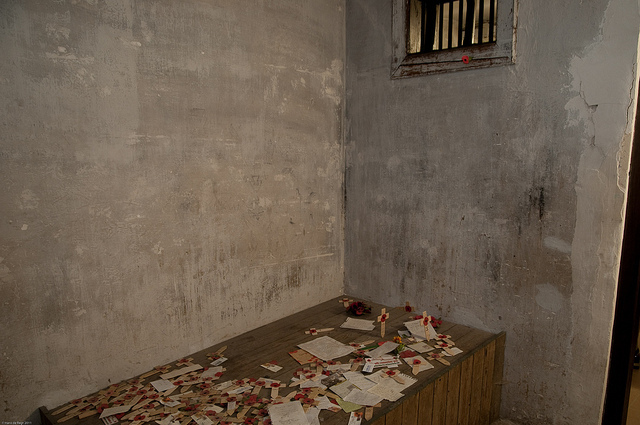 Being under-age (he was 17 when executed) was still not a consideration. 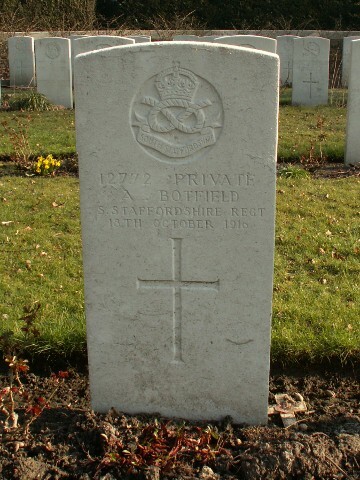 Eric Poole, whose family moved back to the Mother Country, was born in Nova Scotia, serving two years with the 63rd Regiment (Halifax Rifles). Gore was the seventeenth and last soldier executed to be buried here. Begun during the First Battle of Ypres, this cemetery closed for military burials by May 1915, when the New Military Cemetery was started. The cemetery here was full as a result of the nearly 500 civilians buried here at the end of 1914, most having died in a typhoid epidemic. 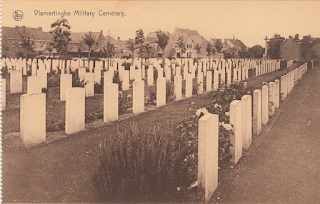 As well as the civilian burials, some 800 French and Belgian soldiers were also buried here. 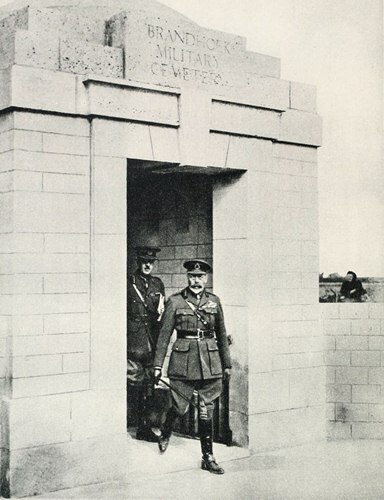 The civilian and the French and Belgian military graves were later removed resulting in the large open space in front of the cross of sacrifice as seen below apart from the grave of Gunner R A Saunders of the Canadian Field Artillery buried beside it. 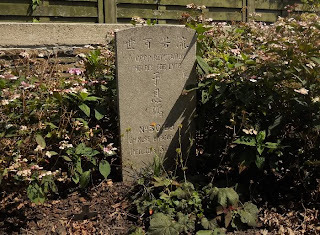 The grave of Coolie C. C. Wang, Chinese Labour Corps, executed for murder on May 8, 1919. 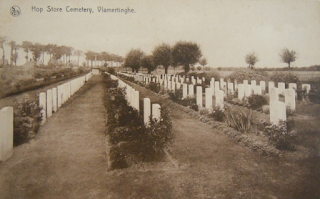 Dozinghem is one of a trio of British Cemeteries which served the hospitals and casualty clearing stations in the locality of Proven. The other two are named Mendinghem (mending 'em) and Bandaghem (bandage 'em) - all three names coined by British troops to sound like local Flemish ones. 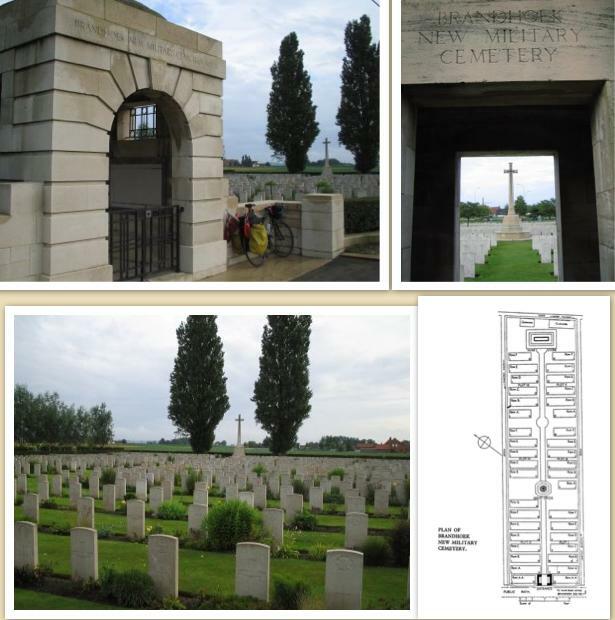 The Cemetery is located to the north-west of Poperinghe near Krombeke. The Cemetery is at the end of a track into woods, off the Krombeekseweg. The image titled Vlamertinghe, from the south west, dated August 1917 by the artist Lieutenant Cyril H Barraund who served in the 43rd Battalion CEF and in August 1917 was appointed to the Canadian War Memorials Fund. At the end of the war with German prisoners on the right, and Chinese labourers crossing a brook in Vlamertinghe in 1919. 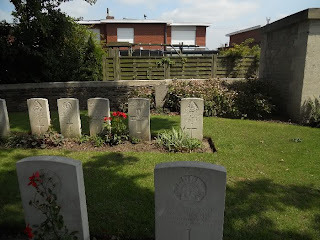 This cemetery is in a village on the Poperinge to Ypres road beneath the rebuilt church. For much of the war it saw intensive activity - during night hours - of transport and troops going to and from the Salient. It was also the site of various medical units. Vlamertinge was often within range of German shellfire and consequently was badly damaged. 1,176 graves of soldiers who died of wounds received in the Salient lie here. 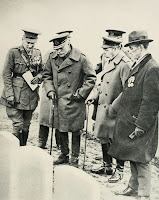 Four Second World War burials dating from the Allied retreat to Dunkirk in May 1940. On 3 October 1917 Frank Hurley photographed his colleague Captain Hubert Wilkins in the cemetery in Vlamertinghe (near Ypres). 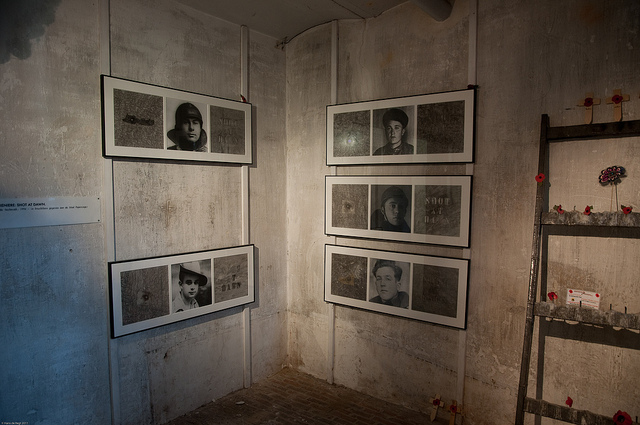 The photograph is quite iconic- Hurley is inside the church and the photograph is framed by an arched window with Wilkins striking a moving pose in front of a row of crosses. 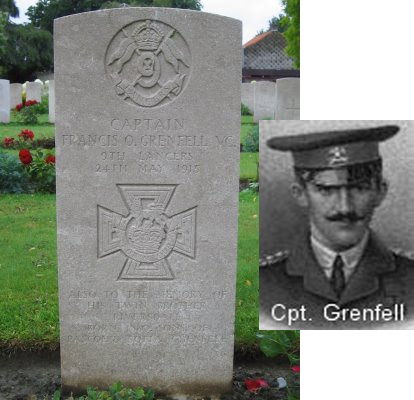 On 24 August 1914 at Audregnies, Belgium, Captain Grenfell rode with the regiment in a charge against a large body of unbroken German infantry. The casualties were very heavy and the captain was left as the senior officer. 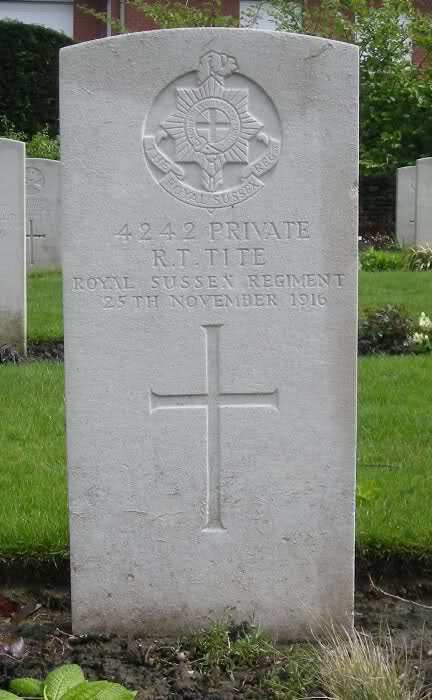 He was rallying part of the regiment behind a railway embankment when he was twice hit and severely wounded. 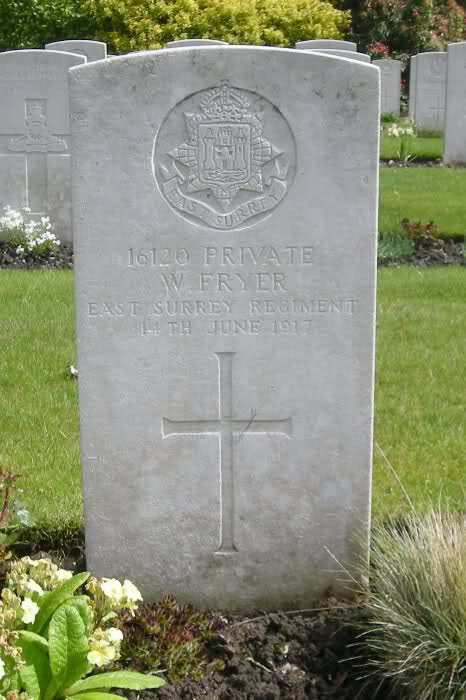 In spite of his injuries, however, when asked to help in saving the guns, by the commander of 119th Battery, Royal Field Artillery, he and some volunteers, under a hail of bullets, helped to manhandle and push the guns out of range of enemy fire. 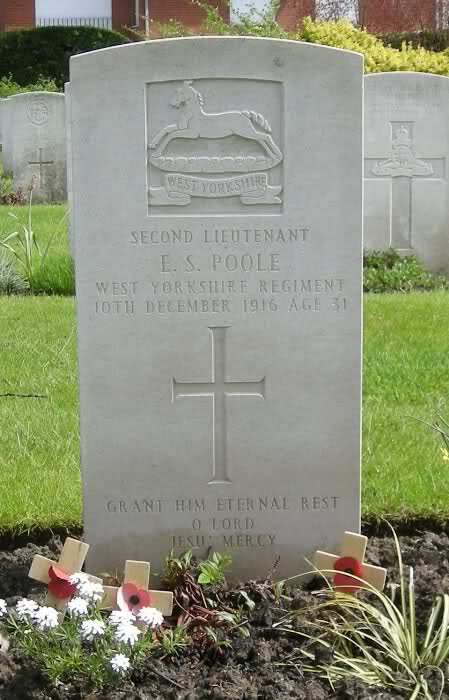 He would later recover from his wounds only to later be killed in action at Hooge on May 24, 1915. 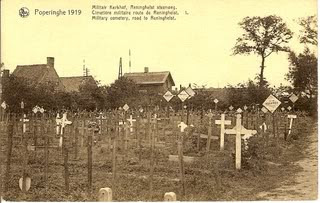 Just beyond Vlamertinge is Hop Store Military Cemetery, containing 248 graves. 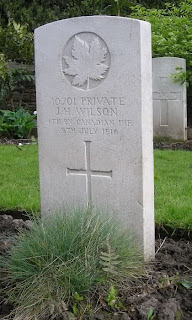 250 British and one Canadian lie here in this cemetery opened in May 1915 and named after the Hop Store which still stands nearby. It was sited on the safe side of the village, was always destined to remain small; due to its position between a hedge and the Hop Store building. Also, as the site was very wet and marshy, by early 1917 it was necessary for the area to be drained by the Royal Engineers. The Hop Store itself still remains, my bike leaning against its façade. During the war it was used by Field Ambulances as well as an HQ for the heavy artillery that was located here. 1813 lie buried here south of the village of Vlamertinge along the N308 (the Poperingseweg) with Ypres another five kilometres away. 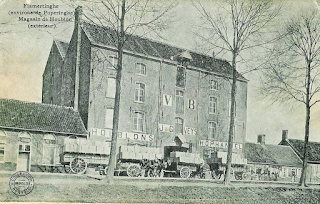 For most of the Great War this town was just beyond the normal range of German shell fire and the village was used both by artillery units and field ambulances. 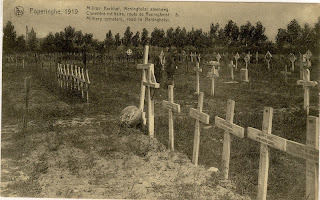 Burials were made in the original Military Cemetery until June 1917, when the New Military Cemetery was begun in anticipation of the Allied offensive launched on this part of the front in July. 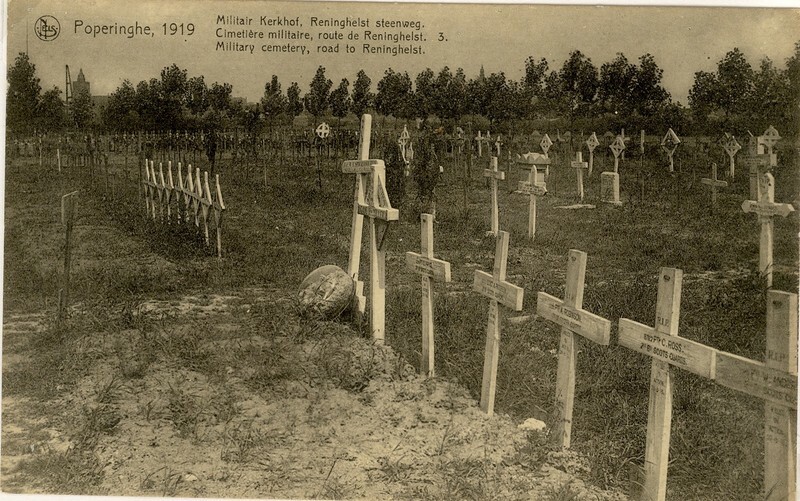 Although the cemetery continued in use until October 1918, most of the burials are from July to December 1917. 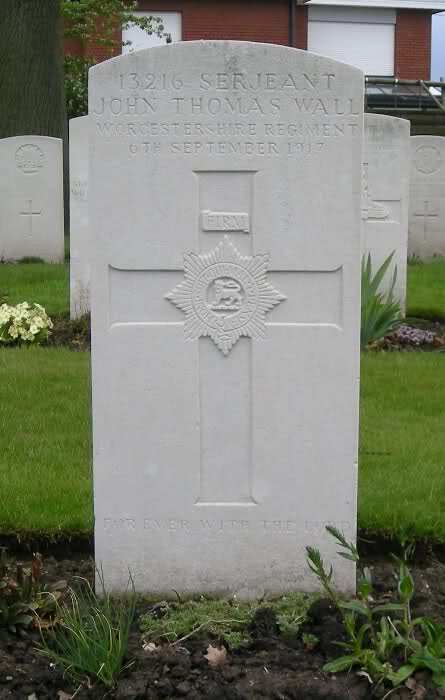 The grave of Victoria Cross winner Acting Company Sergeant Major John Skinner of 1st Battalion King’s Own Scottish Borderers, VC DCM Croix de Guerre killed in action 17th March 1918. 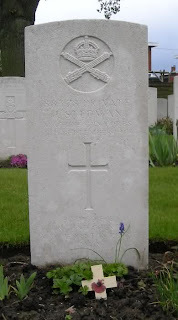 Headstone bears inscription “Father in thy gracious keeping Leave we now thy servant sleeping.” He had joined the Army in 1900 when sixteen years old, was wounded three times in the Boer War, and a further six times in the Great War, the last wound being fatal. For most conspicuous bravery and good leading. Whilst his company was attacking, machine gun fire opened on the left flank, delaying the advance. Although C.S.M. Skinner was wounded in the head, he collected six men, and with great courage and determination worked round the left flank of three blockhouses from which the machine gun fire was coming, and succeeded in bombing and taking the first blockhouse single-handed; then, leading his six men towards the other two blockhouses, he skilfully cleared them, taking sixty prisoners, three machine guns, and two trench mortars. 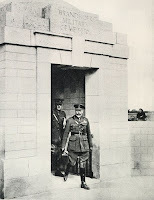 The dash and gallantry displayed by this warrant officer enabled the objective to be reached and consolidated. At the other end of the spectrum is the grave of Private Edward Delargey, shot at dawn for desertion on September 6, 1917; the stone reads nevertheless that “He died that we might live." The cemetery was used particularly in 1915 and in 1917 by regiments and batteries engaged in the fighting around Ypres. The cemetery contains 115 Commonwealth burials of the First World War and one French war grave. Hospital Farm Cemetery is 6.5 km west of Ypres on the aptly-named Hospitaalstraat, a road leading from the N308 connecting Ypres to Poperinge. The farm had been a dressing station from June to October 1917. 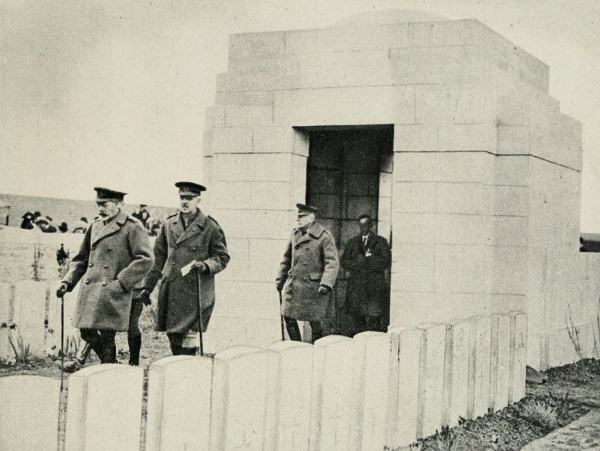 The cemetery was begun by the British in May 1915 in a field next to a dressing station. 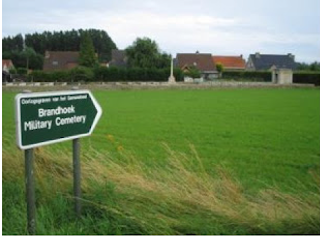 The cemetery was closed in July 1917 when Brandhoek New Military Cemetery was opened. 601 are buried here. Until July 1917 burials had been made in the Military Cemetery, but the arrival of the 32nd, 3rd Australian and 44th Casualty Clearing Stations in preparation for the new Allied offensive launched that month made it necessary to open the New Military Cemetery, followed in August by the New Military Cemetery No 3. 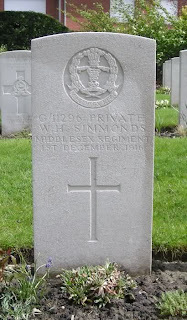 His Headstone is unique in having two small VCs instead of the usual large one. 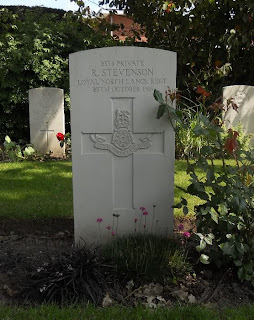 This nearby church continues to honour him and Private C.A. Rudd who was his batman. 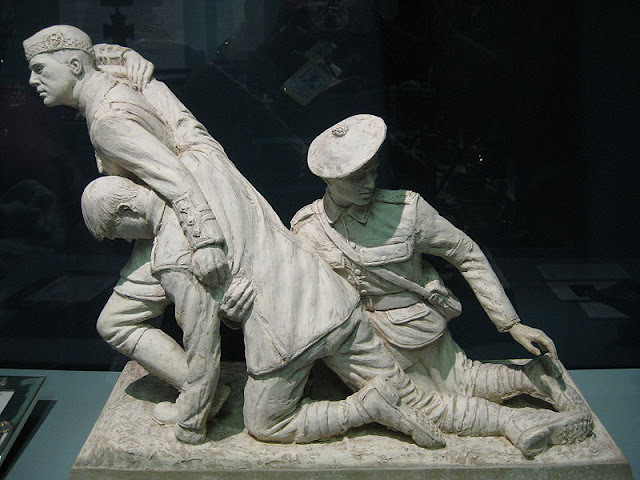 The Noel Chavasse Memorial on display at the Army Medical Services Museum back in the UK. 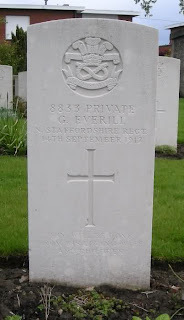 Just beyond Brandhoek is one of the smallest cemeteries on the Salient with 63 burials, the cemetery was only used during April and May 1918.
travelled all the way from Argentina to die within four days of his arrival aged 23. British by birth (educated in Shoreham, Sussex), he had lived in the Argentine Republic since 1911 and was a clerk for River Plate Trust, Loan and Agency Co. Ltd. in Rosario de Santa Fe. 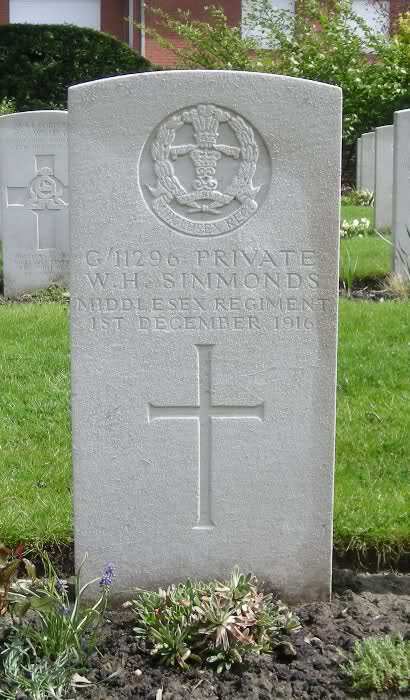 Posted to Stone Buildings, Lincolns Inn as a Private before 9 November 1917 he was attached to No.19 OC Brigade at Pirbright. Officer commanding wrote that he was "intelligent but is weak in topography, should do all right." Discharged on 30 April 1918 upon appointment to a commission in 3rd (Reserve) Bn. 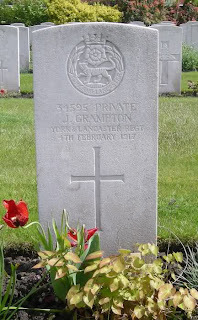 The Loyal North Lancashire Regt., he arrived in Belgium on 27 August 1918 and in letters to relatives that day expressed a fear he would not survive. On 1 September 1918 his company were heavily shelled whilst acting as working parties in the front line. It is unclear whether he was killed outright or died of wounds. His will was in favour of Miss Mabel Choules of Hornchurch, Essex; unsure about the nature of the relationship but it appeared to be a secret he had kept from his family.